I haven’t posted on this blog for a while. Too busy trying to get something done about everything that’s wrong but doesn’t need to be. Apparently, resistance is futile. We will be assimilated by a sea of trash. Plastic trash. Chemical trash. Trash on four wheels. Trash on two legs. I can’t say, “I’m just saying. . . ” because it’s not me who’s saying it. The voice of global common-denominatorism, the purveyor of what we all already know, TIME breaks the silence. And copyright laws notwithstanding, I post the article here in full . . . The annual monsoon transforms Bali. Rain sweeps across slumbering volcanoes. Moss thickens on ancient temple walls. Rivers swell and flush their trash and frothing human waste into the sea off Kuta Beach, the island’s most famous tourist attraction, where bacteria bloom and the water turns muddy with dead plankton. “It happens every year,” shrugs Wayan Sumerta, a Kuta lifeguard, who sits with his love-struck Japanese girlfriend amid dunes of surf-tossed garbage. So why, in early March, did the Bali authorities warn tourists that swimming there for over 30 minutes could cause skin infections? The lifeguard tenderly strokes his girlfriend’s naked leg. “I guess some people just have sensitive skin,” he says. Itchy ocean? Just add it to Bali’s growing list of seemingly intractable problems: water shortages, rolling blackouts, uncollected trash, overflowing sewage-treatment plants and traffic so bad that parts of the island resemble Indonesia’s gridlocked capital Jakarta. And don’t forget crime. In January, amid a spate of violent robberies against foreigners, Bali police chief Hadiatmoko reportedly ordered his officers to shoot criminals on sight. You’ve heard of the Julia Roberts movie Eat Pray Love, which was partly filmed in Bali? Now get ready for its grim sequel: Eat Pray Duck. Most of Bali’s woes stem from a problem that rival resorts would love to have: too many tourists. In 2001, the island welcomed about 1.3 million foreign visitors. Ten years later — and despite bombings by Islamic extremists in 2002 and 2005 that killed 222 people, mostly Australian tourists — the island expects almost twice that number. And there are millions of Indonesian visitors too. When it comes to Bali, newspaper editors have a seemingly bottomless stock of “Paradise Lost?” headlines. Its rich Hindu culture is so distinctive that many people mistake the island for a separate country rather than a province of the world’s most populous Muslim nation. That Bali’s tourism industry has survived terrorism attacks and a global recession is a cause for pride. But amid unchecked growth and a creaking infrastructure, it is also a source of complacency. “It’s like Bali is slowly committing suicide,” says local journalist Wayan Juniarta. He probably won’t find it. Nobody I talked to reckoned that Pastika’s measures would influence who built what where. Bali’s spiritualism might be a bewildering blend of Hinduism, Buddhism and animism, but the island’s planning code is simple: if you build it, they will come. And on the way, they’ll get stuck in traffic. 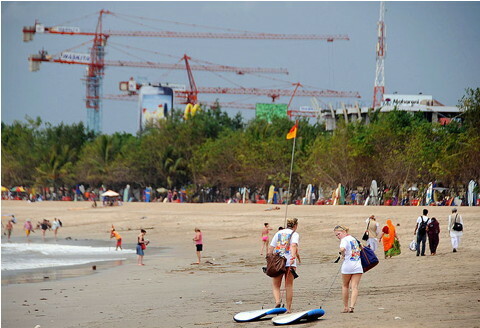 Complaining about the congestion around the airport or in tourist areas like Kuta is now one of Bali’s newest pastimes. Even in Ubud, the seat of the island’s art and culture, once sleepy streets are clogged with buses carrying Chinese tourists, who visit the island in ever greater numbers. Vehicle ownership on Bali is rising at an annual rate (12.42%) that far outstrips the growth in new roads (2.28%), according to government statistics. “Traffic will get worse and worse,” I Made Santha, Bali’s traffic chief, predicted in February. Equally damaging to Bali’s prestige is the perception among some expatriates that the island is increasingly unsafe. Lusiana Burgess, the 46-year-old Indonesian wife of a retired British pilot, was robbed and killed in her North Kuta home earlier this year and her murderer remains at large. An Australian woman awoke in her villa to be gagged and assaulted by four thieves. Then an American man was stabbed during another robbery attempt in Kuta. A week after that, police arrested and — following an apparent escape attempt — shot dead 34-year-old M. Syahri, from the neighboring island of Lombok, who was suspected of robbing a number of foreigners. Wilkin, whose Indonesian wife rents villas to expats and knew Burgess, believes the threat of violent robbery will discourage foreigners from leasing properties in remote places. Investing in CCTV, intrusion alarms and bedside panic buttons may only “give a false sense of security,” he says. Recently, Wilkin accidentally set off his burglar alarm. Nobody went to investigate, not even the private security guards in his own complex. Expat anxiety hasn’t dented Bali’s popularity among its core visitors, the Australians. And why should it? Officially, the Australian government still advises its citizens to “reconsider your need to travel” to Bali due to a “very high threat of terrorist attack,” yet more than a hundred flights arrive from Australia every week. The dangers to new arrivals are those commonly faced by tourists everywhere: dodgy food, motorbike accidents, and — as a sign at my Kuta hotel suggests (“No Jumping from Any Balcony into Pool Is Permitted”) — beer-fueled misadventure. A new terminal at Bali’s shabby airport is due for completion in 2013. But unless other infrastructure is improved, this will serve only to channel yet more tourists onto a critically overburdened island. For now, however, such doubts are largely forgotten in the rush to cash in on the Bali boom. “Goodness shouts, evil whispers,” runs an overused Balinese proverb. But money talks. A good piece Susi, copyright notwithstanding :) It should be widely read, especially by developers and rent-seekers. This article should be read by the authority. It's two thumbs up. Bali is a major Southeast Asian tourist destination, many foreign tourists go there for vacation. The Bali government should make sure that these foreigners are safe during their stay so that they will keep coming back or encourage their friends to visit Bali too. Safety is a major concern of tourists nowadays.